Plot synopsis: A young man, just out of prison, becomes mixed up in his uncle's scheme to acquire the fortune of the latter's rich new wife. Review: Terrible, just terrible. I refer to the atrocious Cockney accent Roddy McDowall adopts for this episode, which is extremely distracting throughout (for British listeners, at least). What makes this particularly jarring is that McDowall was born in London! 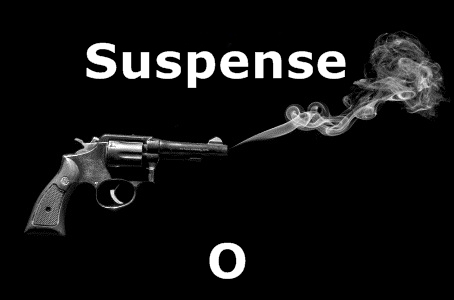 Perhaps he was deliberately putting on an exaggerated accent for Suspense's American audience, or maybe it is the way the script is written - full of clichéd English slang - that makes it seem so bad. Whatever the explanation, it severely undermines the episode's attempt at gritty, 'street' realism. For non-British listeners, the accent issue may not be so important, or even noticeable, so what of the actual story? Terrible, just terrible. The plot is dire, with zero credibility. To take up just one problem, it is entirely unbelievable that the Edna character - who is presented as both relatively wealthy and quite refined - would marry the lower-class criminal 'uncle Bert', who appears to have few, if any, redeeming features. Another issue is that much of the episode is taken up with a lot of nonsense about poison and tea, which gets very tiresome, very quickly. All this is a great pity, as McDowall was a very appealing performer, with a good voice for radio (and it's a shame he didn't do any further - better - Suspense episodes after this one). Plot synopsis: A pilot testing a new experimental aircraft is abducted by aliens mid-flight, who give him a message to deliver to humanity to stop developing and using atomic weapons. Based on a short story by Graham Doar, first published in The Saturday Evening Post, on 24 December 1949.
Review: The contemporary popularity of the story upon which this episode is based, at least among radio and television producers, is attested to by the fact that it was adapted for a number of different series; indeed, it was even used for the premiere episode of Dimension X on radio, and the pilot episode of Out There on television. The adaptations for Suspense (two) and Escape are fairly similar, the former being based on a modified version of the latter's script, while those for Dimension X and X Minus One (which also share similar scripts to each other) diverge somewhat in terms of plotting compared to the Suspense and Escape ones. Of all these versions, the best is probably the first Suspense adaptation, mainly because it stars William Holden, a great actor whether on film or radio. Yet the big caveat here is that I was not particularly enamoured of any of the versions - for the simple reason that the story itself is not very good, however it may have been regarded at the time. In particular, its fundamental message is highly problematic. The story shares much in common with the film The Day the Earth Stood Still (released in 1951), in that it also features an advanced alien race issuing mankind with a warning about the foolhardiness of our destructive ways, and threatening us with dire consequences if we do not change. The problem with this sort of outside interference is that it is infuriatingly paternalistic. In this episode, the Galactic Council that decides to quarantine the Earth comes across like some kind of intergalactic United Nations, operating a type of liberal interventionism that purports to be acting for humanity's own good, but does so by putting a gun to our heads. What these meddling aliens should be told is that it is none of their business: whatever problems humanity creates should be up to humanity to solve. Nonetheless, the idea that human beings might be failing to live up to the standards set by visitors from other worlds appeared to be a common one in the science fiction of the period - see also, for example, the Suspense episode You Died Last Night and the X Minus One episode At the Post. Plot synopsis: A blind private detective investigates the murder of a man who has been blackmailing a beautiful woman. Based on a novel of the same name by Baynard Kendrick, first published in 1945. Plot synopsis: When a man agrees to his wife's suggestion that they join some friends on a weekend boat trip, he soon discovers that she has an ulterior motive for wanting them to go. Review: A solid episode, with some good dialogue, but one which never quite rises enough above average to make it worthy of a higher rating. A sea-based thriller (think films like Dead Calm), the story contains many promising ingredients, including a trio of reasonably well-drawn characters, and explores a number of intriguing themes, such as greed, adultery and betrayal. There is also a fair amount of tension, resulting from the fact that most of the action takes place within the confined space of a boat at sea, offering the protagonist slim hope of escape. Perhaps most interesting is that there is a degree of ambiguity in how the plot is finally wrapped up, since not every question is fully answered concerning the characters' fates. All this is good, but at the same time, there aren't that many surprises, or any especially startling twists, and the episode doesn't really rank alongside the very best thrillers that Suspense produced.